When we become parents we tend to see things rather differently in the world. We tend to become even more aware that our actions have an impact not just on family and friends, but on the world as a whole. Whilst we can sometimes be overwhelmed by the information out there, there are some very simple choices that we can make to help protect the planet for future generations. Do you really know how many toxic substances you have lurking in your household? You may be shocked to find out! We can most definitely make a difference in the choices that we make every day. And one of those choices is which cleaning and household products that we use. Many people just don’t realize how much of an impact on the environment everyday household cleaners and products actually have. Household cleaners and detergents are some of the most toxic substances to which we have every day exposure. You may be very unaware of the dangers lurking in your kitchen cabinet! We all know that chemicals such as bleach are poisonous and we should always take measures to lock them away from our children, but many people still think it is fine to use them as products in our home. But these chemicals are not only unsafe if they are swallowed, they produce fumes when used, and have huge detrimental consequences on the environment when being produced and disposed of. You may be very surprised to learn that there are 17,000 petrochemicals available for home use and many of these are used in household cleaners. Amazingly only 30 percent of these chemical have been tested for exposure to human health and the environment. There are alternatives to harsh chemicals which do actually work and do the job just as well as ‘traditional’ products. Seventh Generation was one of the pioneers of the green product revolution – they are celebrating their 25th anniversary in 2013. Labels can be so confusing and no one wants to spend time at the store having to read a list of ingredients. Here is a list of just some common dangerous chemicals found in many household products: alkylphenol ethoxylates (APEs), ammonia, antibacterials, butyl cellosolve, chlorine bleach, diethanolamine, phosphates, sodium hydroxide, and sodium laurel sulfate. Look in your kitchen and bathroom cabinet to see if you have products with any of these chemicals in them. Then seriously consider, for your health and the health of the environment, replacing them with a product such as those offered by Seventh Generation. 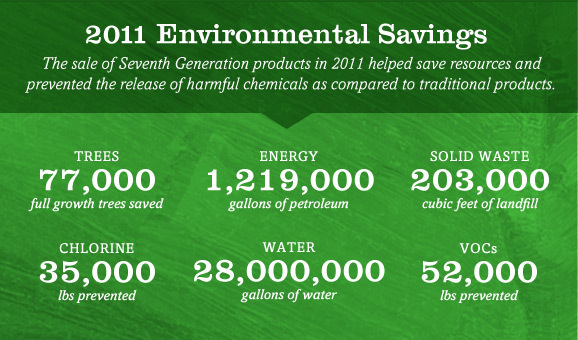 This picture shows how much of a positive impact Seventh Generation has in reducing the impact of products on the environment. The change to using natural cleaning products such as those made by Seventh Generation is something to consider for your family and the sake of the environment. The more people that make the switch the safer our environment will be for us now and for future generations. This post is sponsored by Seventh Generation. 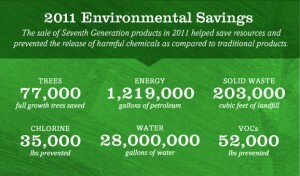 We use many Seventh Generation products and have done for many years – our opinions as always, are our own. Looking for Amazon Mom Diaper & Baby Coupons?